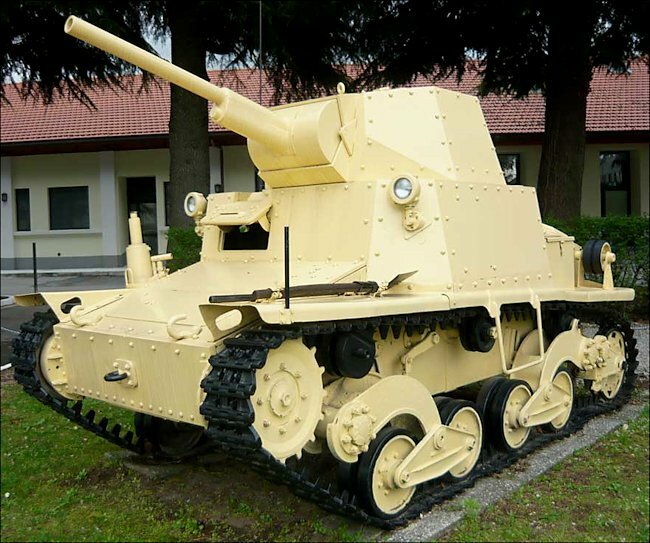 The Italian Army WW2 L6/40 Light Tank was armed with a 20 mm Breda Modello 35 gun. The tank could carry 296 rounds. It was also armed with a 8mm Breda 38 coaxial machine gun. The tank only weighed 6.8 tonnes and was powered by a SPA 180 four cylinder 70hp engine. It had a maximum road speed of 42 km/h (26 mph). It was produced between 1939 and 1944 by Fiat-Ansaldo. Records show that 283 were produced. They were deployed by Italian Army units on the eastern front alongside the Semovente 47/32 self-propelled gun. They also saw action against British and Commonwealth troops during the North African campaign as well as in the defence of Sicily and Italy. When the Italians surrendered the German Army used surviving L6/40 in the Italian campaign. 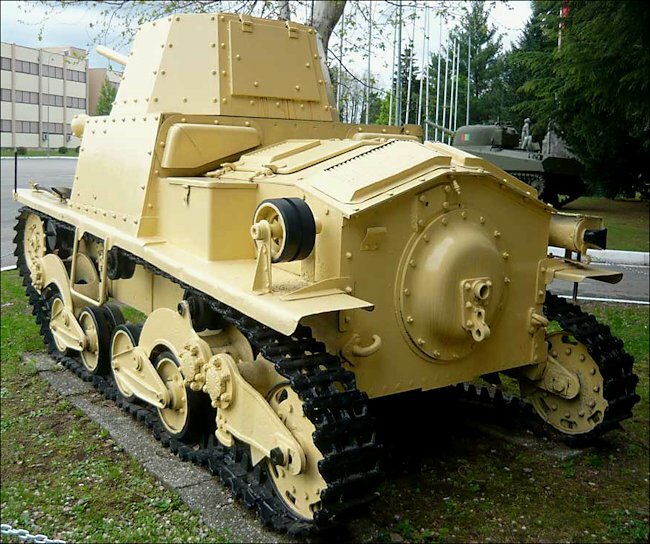 The Italian designation Carro Armato means armored tank. The letter L stands for Leggero which is Italian for light. The number 6 represents the weight of the tank in tonnes i.e. 6 tonnes. The number 40 indicates the year of adoption by the Italian Army 1940. The tank crew were protected by riveted armour that ranged between 6 mm to 40 mm in thickness. Although by modern standards this seems very thin, at the beginning of WW2 it was very similarly constructed to many equivalent Allied light tanks. The maximum thickness 40mm armour was only found on the gun mantle and frontal glacis. The L6/40 was a good light tank for its size and a big improvement over the tankettes that were common within the Italian army at the beginning of the war. The low silhouette of the vehicle made it useful for reconnaissance, and its main gun was effective against any light vehicles it might encounter. However due to the lack of medium tanks it was often employed in a front line combat role against heavier enemy tanks like the M3 Grant, Crusader and M4 Sherman, for which it was unsuited. This small light tank meant that conditions for the two man crew were very cramped. The tank driver sat in the front right of the hull. The Commander/Gunner sat on the left side of the tank. To facilitate these crew positions you will notice that the tank turret is positioned on the left side of the tank rather than being in the middle. 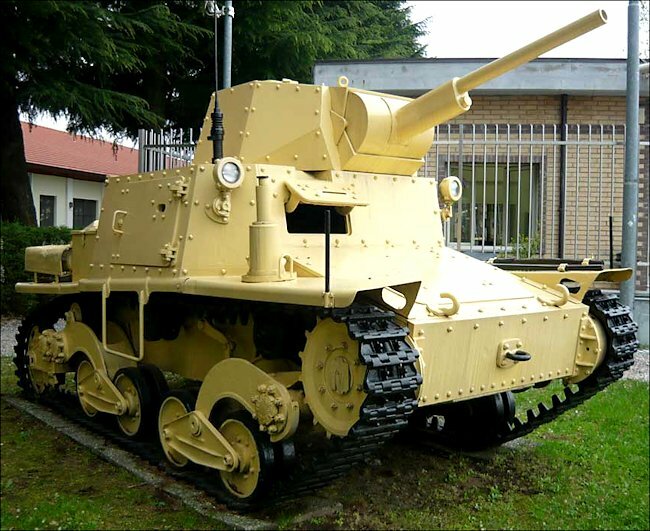 In the 1950’s this tank was set up as a monument inside an Army barracks in Vercelli. At that time it was missing its turret and this configuration may indicate it had been used as a turret-less tractor by the Germans. After that it was moved to the Caserma Cadorna in Legnano (about 5km south of Solbiate Olona). There it was displayed with a fake turret made of sheet metal. It was restored by OTO Melara some years ago and now has a better steel replica turret. Other parts are also not original, including the lifting jack, antenna, glacis lights and some road wheels. When in Legnano it was displayed on a stone and concrete plinth and was painted overall in a brown and sand camouflage scheme. At that time it carried the registration number 'RE 4053' painted on its nose. The L6/40 tank chassis formed the basis of a couple of variants like the Lf flame tank. The main gun was replaced by a flamethrower with 200 litres of fuel. Some L6/40 tanks were converted to command-tank variants. They were fitted with extra radio equipment in an open-topped turret. The most successful of the L6 variants was the Semovente 47/32, which eliminated the turret and substituted a 47 mm anti-tank gun in the open-topped hull.